In 2010, Lake County received an ARRA (American Recovery and Reinvestment Act) award of $66.3 million to improve broadband access in their area; about $10 million of the award was an outright grant; the rest was a low-interest loan. At the same time they were working on the ARRA application, nearby Duluth was working on encouraging Google Fiber to choose them for their first Google Gig community. Champions included County Commissioners and a local tech entrepreneur, Chris Swanson. It was a time when the community was optimistic and the need was great. Local providers were saying it would be 10-15 years before they upgraded the connection and the existing connection proved unreliable when a broken steam pipe caused a 12-hour internet outage over three counties in Northeast MN. There were bumps along the road to getting fiber to the community and bumps remain. As it stands today, there are portions of the county that are not yet served with fiber, an outstanding loan, and local provider Lake Connections is looking to sell the network while it is managed by Consolidated Telecommunications Company (CTC). But when asked about it, local champions are unapologetic because they accomplished what they set out to do, and they are reaping benefits. 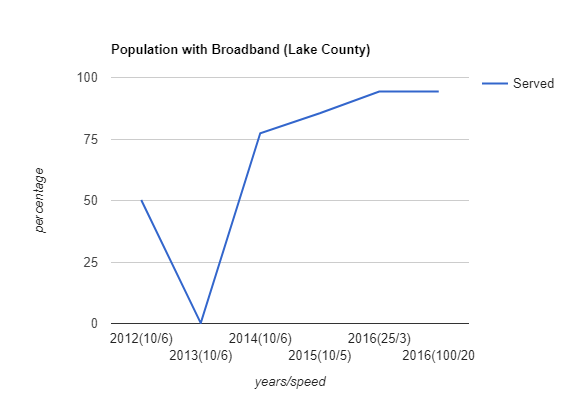 But access is only part of the equation, Lake County boosted broadband adoption and increased sophistication of use by becoming a Blandin Broadband Community (BBC) in 2013-2014. They gave computers to low income families, provided hours of training to a wide range of people (65 classes), and purchased community iPads to get people started using technology. Many of the projects, especially at the school, were led by broadband champion Kris Lee. Other than the apparent anomaly in the mapping in 2013, the chart shows the connection in Lake County increased significantly before 2014 and they are poised the meet the 2026 speed goal. How is Lake County Doing? We met with community leaders, educators and entrepreneurs at the new Two Harbors high school. We learned that the county is well-served but not entirely served yet and there are pockets in the region (outside of Lake County) without access. That would never have happened without the policymakers investing in the network back in 2010. The question of who should own and operate the network may be an issue, but you can’t take away the network. Median household income is growing, house prices are climbing and anecdotally, residents say more families are moving in because of the broadband connection. It’s an additional asset to the community: there’s Lake Superior and there’s fiber. While the county is served, the region is not and the disparity is clear. It opens the door to making some areas more desirable, but leaves the unserved at a real disadvantage. Unfortunately the school has to mitigate that imbalance when developing curricula because not every student can do online homework from home. Lake County is picturesque. It spans from Lake Superior, to the Boundary Water Canoe Area, to the Canadian border. Tourism is the leading industry. They are finding that while some folks thought that broadband might distract vacationers, it’s drawing more people and allowing people to stay in the area longer. Resorts are finding that guests extend their visit when they can work while away. Each day of extension means greater revenue for the local shops, restaurants, lodging and attractions. Lake County deployed WiFi with a fiber back-haul at the campground in time for the summer season. People are amazed at the speeds. They found that despite a summer of rain, they had a record number of campers up 22% from normal. Better broadband is certainly a contributing factor. Meeting with local residents, it is clear that what they enjoy about broadband is the freedom to live where they want with the lifestyle they want, which often means by the lake or in the woods. Areas considered too remote for broadband in some counties are attracting new families in Lake County. Incoming resident Patrick Krekelberg of Krekeltronics can live anywhere he can get online. But he needs enough broadband to collaborate in real time with clients and partners to provide technology integration solutions. That means fiber. He is planning to move his family of six to Two Harbors soon. His wife home schools their four children, which also requires high-speed broadband. For long-term residents, better broadband helps them do what they do better. Chris Swanson has a digital marketing firm (Pure Driven) with a distributed workforce of 16 employees and 25 full time contractors scattered around Minnesota. He produces content for businesses all over the world, which means a steady stream of data to and from the cloud. They use a centralized phone system that supports video conferencing and constant collaboration. With asynchronous broadband, communication and content sharing wouldn’t work; super-fast broadband gives him an advantage over competitors, even those in large cities. John Bathke is a local realtor, and broadband is making his life easier. John got his fiber connection two years ago; prior to that he had DSL that was slow and poor quality. It was so bad that they had trouble with online purchasing and other interactive websites. Uploading images to the real estate website is much easier now. Just that morning he had uploaded 11 photos in 3 seconds. A job that would have taken an hour before. Broadband has been good for John’s business outside of operations. He has seen more folks from cities (Duluth, St Paul, Minneapolis) look at the area as housing becomes more pinched back home. People want homes with broadband, especially for vacation homes. The week we spoke, John had two ready buyers – one from Canada, one from Missouri. Both said top needs were broadband and electricity. Conversely there are people “on the wrong side of the lake” with limited or no broadband who are unable to sell. Most students in Lake County have broadband at home, but not all. That has been an issue and they are working on it with mobile hotspots. Unfortunately, not even the mobile hotspots work in some areas. But they have been able to move parent communication online. They no longer send paper notes, report cards or warning notes home, which leads to cost-savings on printing, but more importantly it gets parents involved in students’ education in real time. Instead of waiting until midterm to hear about any issues, parents can (and do!) check students’ work online when intervention can be most helpful. Through their BBC programming, Lake County created a Student to Senior Technology program. At the first session 23 teen volunteers assisted 36 senior community members with specific tech request in an each-one teach-one model. Those meetings continued formally for seven weeks, but the intergenerational bridge remains strong. In fact, in June 2017, Two Harbors received the 2017 MetLife Foundation/Generations United Best Intergenerational Communities Award.